President of Ukraine Petro Poroshenko wants to hear from Ukrainian presidential candidate Volodymyr Zelensky why he is supported by a number of Russian and Ukrainian politicians who fled to Russia, including State Duma Deputy Vladimir Zhirinovsky, Communist Party leader Gennady Zyuganov, former Prime Minister and former President of Ukraine, Mykola Azarov and Viktor Yanukovych. "I don't like it when everyone from Zhirinovsky to Azarov, from Yanukovych to Zyuganov supports the president [presidential candidate] of my country. I don't like it. But I don't blame anyone - I think the candidate himself could explain this situation. But for some reason he doesn't do that. I don't think that it is very good. This is disrespect not for Poroshenko ... This is disrespect for the people, for the voters," said Poroshenko at the NSC Olympiyskiy in the center of Kyiv on Sunday, where he arrived for a debate with a presidential candidate Volodymyr Zelensky, answering journalists' questions. The president considers it dangerous for the country when a virtual candidate participates in the election campaign. "I don't like it when we have a virtual candidate instead of participating in the debates ... Because when the candidate sprinkles on the screens, but doesn't say anything, for the majority it's just a plot from the movie "Servant of the People." But we are not electing Holoborodko [the main character of the film acted by Zelensky] - we are electing the president of Ukraine," said Poroshenko. 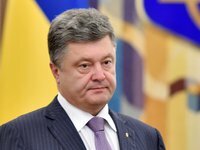 Poroshenko said he wants to know Zelensky's position on the most important areas of the implementation of the powers of the president of Ukraine, as Supreme Commander-in-Chief of the Armed Forces of Ukraine, and as a guarantor of constitutional rights and freedoms of citizens, and as a defender of Ukraine.